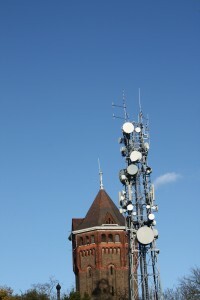 The number of communications masts around the summit of Shooters Hill are a testament to the hill’s appeal as a communication centre. However the hill’s height and prominence, which make it attractive for modern wireless communication, coupled with its position guarding the route from London to the coast, have made it appealing to communicators for centuries. AS in warre, celeritie availeth no lesse, than force it selfe: So the Right honorable Sir William Brooke, Lord Cobham, and Lorde Chamberlaine of hir Majesties houshold (who hath been sole Lieutenant of this shire, since the first of hir Majesties Raigne) foreseeing how necessarie it was to have the forces of the countrie speedily draw togither, for the encounter of any hostilitie: and finding, that upon the fiering of the Beacons (which are erected for that service) not only the common sort, but even men of place and honour, were ignorant which way to direct their course, & therby (through amasednesse) as likely to run from the place affected, as to make to the succour of it: caused the true places of the Beacons to be plotted in Carde, with directorie lines, so many sundrie waies, as any of them did respect the other: By which, any man, with little labour may be assured, where the danger is, and thereof informe his neighbours. 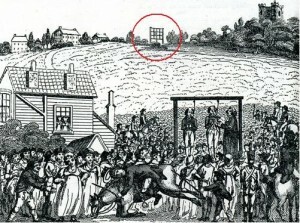 For example: suppose our first Beacon, standing on Shooters hill, to be light: he that will go thither may know by the watchmen from whence they received their light, which must be either from the West neare London, or Hamstede: or else from the East, by warrant of the fiered Beacon at Stone neare Dartford, or of that which is neare to Gravesende. The like of the rest: and so much for use. 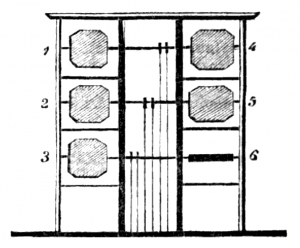 Bagnold also describes the 1747 experiment in telegraphy using static electricity conducted on Shooters Hill by Dr Watson, bishop of Llandaff. 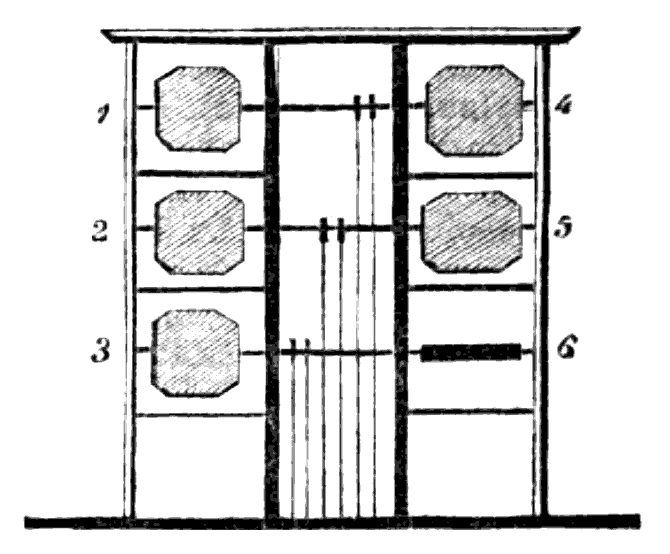 The “observers” of the transmission stood on (insulating) amber while holding an earthed iron bar in one hand and the end of the two-mile long transmission wire in the other. A gun was fired when the transmission started and the observer timed the difference between when they heard the gun and when they received an electric shock! Shooters Hill was a link in the next advance in communications as well – the Semaphore line. This used a set of rectangular frames containing six 5 foot high shutters to transmit messages between London and the coast. 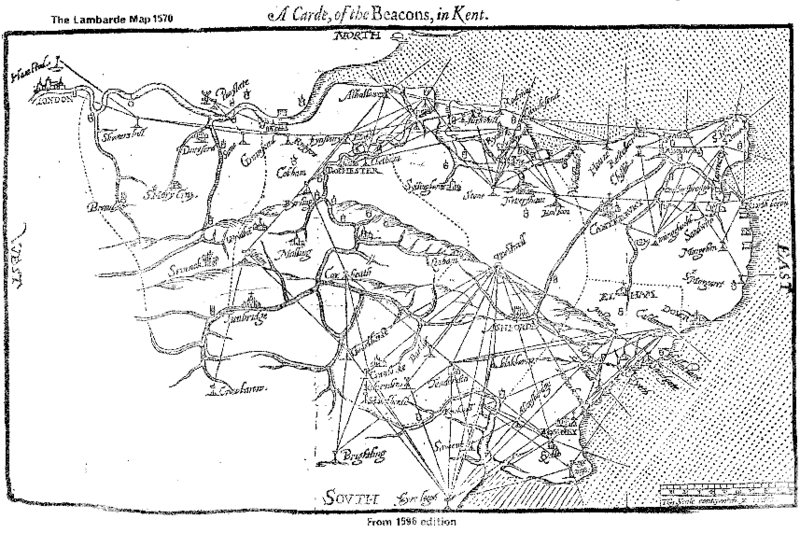 The first to be completed was between London and Deal in January 1796, with the following chain of stations: Admiralty (London), West Square Southwark, New Cross, Shooter’s Hill, Swanscombe, Gad’s Hill, Callum Hill, Beacon Hill (Faversham, branch point), Shottenden, Barham Downs, Betteshanger, Deal. The New Cross station was situated on Telegraph Hill – the Telegraph Hill Society’s web page includes a copy of a water colour sketch of the telegraph station, with the Shooters Hill station just visible in the distance. 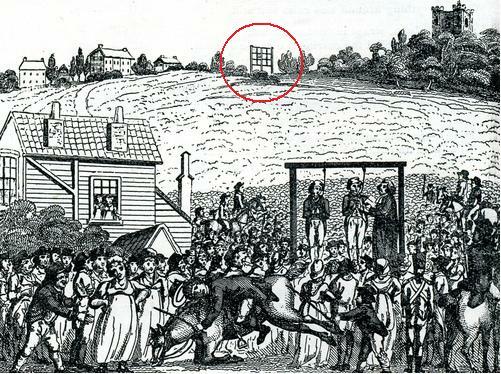 As can be seen in Pocock’s wood-cut below, the Shooters Hill station was on the ridge of the hill in an area known as Telegraph Field, which is now the site of the Memorial Hospital. (You may recognise the top of this picture because it used to form the banner picture for this blog). At its best this line could send a signal from London to Deal and back in two minutes. Perhaps this was the inspiration for the Disc World Clacks system which featured in various of Terry Pratchett’s books, such as the magical “Going Postal”, though the Ankh-Morpork system seems to have been considerably quicker than the UK Admiralty’s! the windows of the Victorian Water Tower at the crest of the hill – also opposed by local residents. However not all the masts are for mobile telecommunications. Some are thought to be communications systems for taxis or the ambulance service. The mast that can be seen behind the dairy in Foxcroft Road has been identified as a transmission mast for FM and DAB radio, for example the Digital One multiplex which carries a number of DAB channels including Talksport, Absolute Radio and Classic FM. The Port of London Authority, who worryingly are advertising on their web site the availability of mast sites on Shooters Hill to telecommunications companies, have a mast just off Shooters Hill Road. This mast is a base station for the Automatic Identification System (AIS) which is used to identify and locate ships around the world, for example as shown in the map below from the Marine Traffic web site. The PLA mast also has a direct microwave link to a PLA Vessel Traffic Services (VTS) radar station at Blackwall Stairs, just across the river from the O2 dome. Ham Radio enthusiasts also take advantage of Shooters Hill’s prominence, for example the Cray Valley Radio Society 2010 Summit was held in the highest pub in South London, the Bull at 416.7ft. The Society will be holding a Christmas Social Evening in the Bull in a couple of weeks time on Thursday 15th December 2011. What next for communications in Shooters Hill? Well the 4G, or Long Term Evolution (LTE), technology is being trialled already – one trial by O2 includes the area around the Dome and Canary Wharf as well as central London. Live networks aren’t expected until 2014 beacause the frequencies won’t become available until analogue TV is switched off next year, but we can expect masts to be upgraded beforehand. And after that …. who knows, but I wouldn’t be surprised if Shooters Hill was still a communications centre.